Background/Purpose: To assess whether presence of spondyloarthritis (SpA) manifestations in first- and second-degree relatives of patients with chronic back pain (CBP) is associated with higher risk for axial spondyloarthritis (axSpA). Methods: The SPACE cohort includes patients with CBP (≥ 3 months, ≤ 2 years, onset <45 years) from various European rheumatology centers. 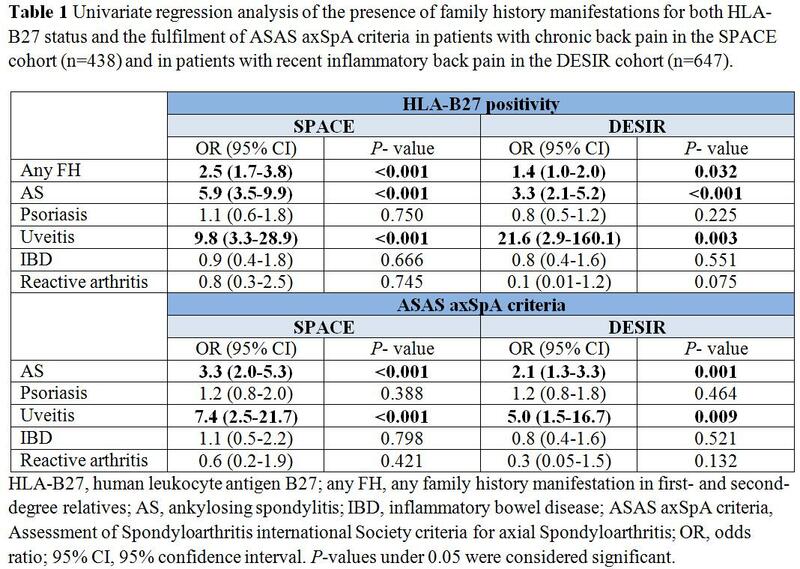 DESIR is a French prospective multi-center cohort of patients with inflammatory back pain (IBP; ≥ 3 months, < 3 years, onset < 50 years), suggestive of axSpA. Patients underwent a full diagnostic work-up at baseline including MRI and radiographs of sacroiliac joints (local reading), laboratory assessments (e.g. HLA-B27), and assessment of all other SpA-features. Patients were asked about the presence of SpA manifestations in first- and second-degree relatives. A positive family history (PFH) was defined as having a positive family history in first- and second-degree relatives for at least one of the following SpA manifestations: ankylosing spondylitis (AS), psoriasis, uveitis, inflammatory bowel disease (IBD), and reactive arthritis. First, we assessed the association between PFH manifestations and HLA-B27 positivity in patients. Secondly, we assessed the association between PFH manifestations and axSpA using fulfilment of the ASAS axSpA classification criteria as a proxy for diagnosis. This approach circumvents circular reasoning in diagnosis but allows only assessment of the relative contribution of the various manifestations. Results: In total, 438 patients from the SPACE cohort and 647 patients from the DESIR cohort with complete information on SpA manifestations in relatives were analysed. In the SPACE and DESIR cohort mean age (SD) was 31.3 (8.3) years and 33.6 (8.6) years, 38% and 47% of patients were male, and mean symptom duration was 13.4 (7.4) and 18.1 (10.5) months, respectively. In 20.6% and 19.6% of patients AS was reported in first- and second-degree relatives, psoriasis in 19.0% and 19.9%, uveitis in 6.2% and 4.5%, IBD in 7.5% and 5.0%, and reactive arthritis in 3.2% and 0.9%. Any PFH was reported in 42.2% and 38.5% of SPACE and DESIR patients, respectively. In both the SPACE and DESIR cohort AS (OR 5.9 [3.5-9.9] and OR 3.3 [2.1-5.2]), uveitis (OR 9.8 [3.3-28.9] and OR 21.6 [2.9-160.1]), and any PFH (OR 2.5 [1.7-3.8] and OR 1.4 [1.0-2.0]) were significantly associated with presence of HLA-B27 in CBP and IBP patients, respectively (Table 1). Fulfilment of the ASAS-criteria showed similar results: AS (OR 3.3 [2.0-5.3] and OR 2.1 [1.3-3.3]), uveitis (OR 7.4 [2.5-21.7] and OR 5.0 [1.5-16.7]). No association was found for psoriasis, IBD, or reactive arthritis in both cohorts. Multivariate regression analysis showed the same trends for both cohorts (not shown). Conclusion: These data suggest that in the diagnostic work-up of patients with chronic back pain suspected of axSpA only a positive family history for AS or uveitis is of value. Disclosure: Z. Ez-Zaitouni, None; L. Gossec, None; I. J. Berg, None; R. Landewé, None; M. van Oosterhout, None; M. Lorenzin, None; M. Dougados, None; D. van der Heijde, None; F. van Gaalen, None. Ez-Zaitouni Z, Gossec L, Berg IJ, Landewé R, van Oosterhout M, Lorenzin M, Dougados M, van der Heijde D, van Gaalen F. Is a Positive Family History of Spondyloarthritis of Value in Patients with Chronic Back Pain? Results from Two Large Early Back Pain Cohorts [abstract]. Arthritis Rheumatol. 2016; 68 (suppl 10). 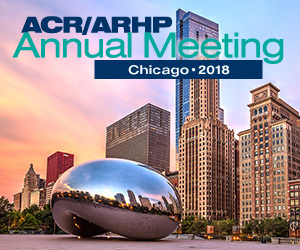 https://acrabstracts.org/abstract/is-a-positive-family-history-of-spondyloarthritis-of-value-in-patients-with-chronic-back-pain-results-from-two-large-early-back-pain-cohorts/. Accessed April 22, 2019.